Is it possible that there was once life on Mars? To have life, you need to have water. Was Mars once covered in water like Earth is? That's what some scientists are trying to figure out. By studying rocks and minerals on Mars, scientists can determine whether they were formed in or shaped by water. They're getting one step closer to determining if there has been life on Mars. But if it was there, what happened to it? And if there's never been life on Mars, why not? 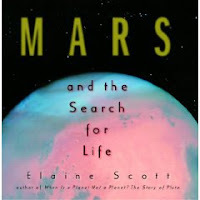 Elaine Scott, author of When is a Planet Not a Planet?, turns her attention to the red planet in this book. She provides a brief history of Mars exploration and details recent expeditions to Mars. In clear, simple language she explains how scientists determine information from Martian rocks and how robots travel to Mars and collect information for scientists back on Earth. Is it possible that humans might walk on Mars in the semi-near future? There are a lot of obstacles to that goal, but walking on the moon once seemed impossible, too. Scott provides an author's note about how she was inspired to research and write this book. She also provides a schedule of upcoming Mars expeditions and suggestions for further reading. This would make a great book for browsing and is detailed enough for reports. Hand it to budding astronomers along with Team Moon and Mysterious Universe. Happy Nonfiction Monday! Get the roundup at Picture Book of the Day. I always find such good suggestions on Nonfiction Mondays. Thanks for this one--looks like one for us!